Custom Catalog | Camisasca Automotive Manufacturing, Inc.
Up to 2 lines of detailed graphics are permanently laser etched in black or silver into metal for a beautiful contrasting look that will not scratch or fade. Available in 3 different finishes - Polished Mirror Bright, Maintenance-Free Brushed, and Black Powder Coated - in various frame styles to meet DMV requirements in your state. Matching frame finish hardware hider caps are also available to complement your frame, or enhance and protect your frames with our PlateSafe shield and patented anti-theft security caps. All frames are made from sturdy, rustproof 20 gauge stainless steel, and guaranteed for a minimum of 4 years of exterior use. Custom nameplate graphics available with up to 3 colors on a white, silver or black background in 6" or 10" long formats; Clear polyurethane doming is added for protection and an enhanced look. Available in 4 different finishes - Polished Mirror Bright, Maintenance-Free Brushed, Black Powder Coated and Black Pearl - in frame styles that do not block DMV registration tags in most states. A classic luggage style keychain made from heavy gauge stainless steel in your choice of short or long body style. Your custom graphics are available on one or both sides of the keychain using a permanent black laser etching process, or full color screen printed with a clear protective dome. Available in Polished Mirror Bright and Brushed body finishes and your choice of plain, white stitched, or red stitched genuine black leather strap. Nickel-plated universal split ring available in choice of three sizes, or substitute a jewelry quality padlock key ring for a nominal fee. Quality recyclable PET retail display boxes also available. Made from heavy gauge stainless steel and genuine black leather. Available in Polished Mirror Bright and Brushed finishes. Your custom graphics are available on the front of the stainless steel keyfob using a permanent black laser etching process, or screen printed with a clear protective dome. 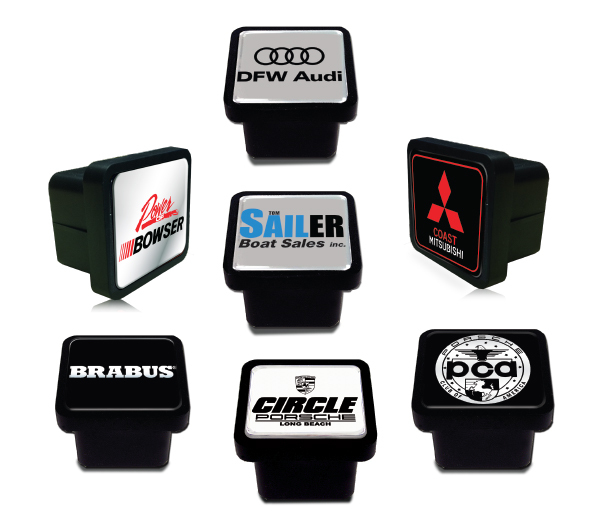 Optional black laser etched graphics are available on the backside of the keyfob body for a nominal fee. Keyfob features a premium nickel plated flat split key ring. Front side features your full color logo or a one color genuine carbon fiber logo sealed under a high gloss protective dome. Optional custom laser etched graphics are available on backside of the medallion. 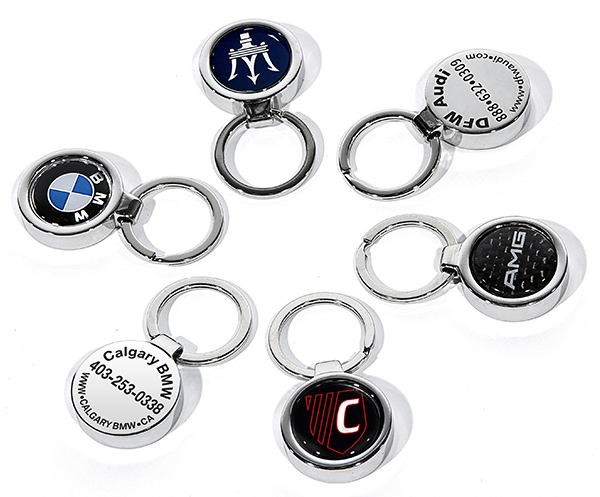 Automotive Dealers: Medallion Keychains are available only to authorized dealerships of trademarked logos. Dealership information must be presented on the backside. Classic luggage style keychains made from exquisite carbon fiber composite and stainless steel. Your custom graphics are available on one or both sides of the keychain using a one color screen-printing process. Each keychain is 5/16" thick and features a clear polyurethane coating to enhance the beauty of the carbon fiber weave as well as prevent graphics from rubbing off over time. Keychains feature a genuine leather strap with white or red stitching and sturdy nickel plated flat universal key ring made from spring steel. A jewelry quality padlock key ring can also be substituted for a nominal fee. Quality recyclable PET retail display boxes are also available. Sports tag style keychains made from exquisite carbon fiber composite and stainless steel, featuring a clear polyurethane coating to enhance the beauty of the carbon fiber weave as well as protect the color from rubbing off over time. Your custom graphics are available on one or both sides of the keychain using a permanent black laser etch process for the stainless steel side and one color screen-printing for the carbon fiber side. Stainless steel front side available in Polished Mirror Bright or Brushed finish. Keychains feature a genuine leather strap with white or red stitching and sturdy nickel plated flat universal key ring made from stainless steel. Front side features a high gloss genuine carbon fiber insert under a clear scratch resistant dome with a plain or custom one color screen-print graphic choice. Your custom graphics are also available on the backside using a permanent black laser etch process. Keychains feature a sturdy nickel plated flat universal key ring made from spring steel. Detailed graphics permanently laser etched into the black powder coat to reveal the brushed stainless steel for a beautiful contrasting look. Plates are made from heavy rustproof 304 stainless steel, and guaranteed for a minimum of 4 years of exterior use. Available in two or four hole mounting styles. Designed to fit in any of our custom license plate frames, or simply add our patented hardware hider caps for a finished look. All plates are made from impact and UV resistant polycarbonate that will not yellow or crack with normal use. Your custom graphics are applied using our unique backside printing process and will not fade, scratch, or chip. Standard U.S. with two or four mounting holes to aid in a secure fit, and universal mounting application. 0.010” thick high quality white polyester is durable and water resistant. Digital full color printing with unlimited colors at no additional charge. Each card has 0.125” white margin. Standard U.S. plate size with universal four hole mounting style. Low minimum order of only 500 pieces. A unique way to attract motorists off of the street and onto your lot. 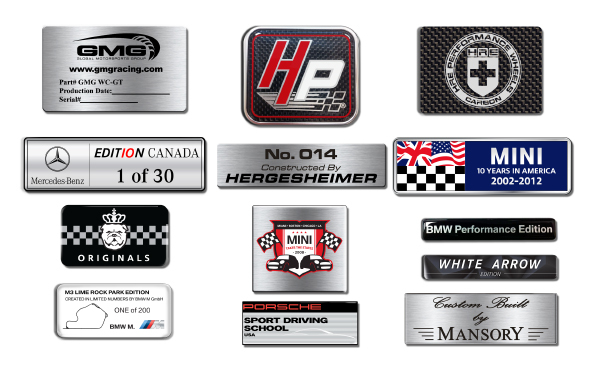 All dealership plaques are made from .0375" thick aluminum precision laser etched with up to three lines of information. Standard with exterior grade double sided tape for a permanent fit on most flat or horizontally curved painted vehicle surfaces. Optional magnetic backing is also available for easy removal during vehicle cleaning. Choose from a black or white background with contrasting silver graphics. Add clear doming for additional UV and scratch protection at a nominal fee. Made from heavy gauge stainless steel, carbon fiber composite, or aluminum with a self-adhesive backside, suitable for both exterior and interior application. Custom full color graphics produced using proprietary processes developed in our OEM supply programs. Available finishes: Polished Mirror Bright, Brushed, Satin Silver, Black, White, and Carbon Fiber Composite. Custom sizes available up to 10" x 12". Clear polyurethane doming protects custom color plaques from surface scratching and UV exposure. Doming can also be added to non-color plaques to enhance the look at a nominal fee. Simple and effective design covers and protects the hitch receiver from dirt and debris. Includes a matching lanyard designed to keep the cover secure when not in use. Made from durable, exterior grade black plastic with UV inhibitors. Features your custom color screen-printed or black and silver photo etched message under a protective clear polyurethane doming. Options available for both 2" or 1.25" tow hitch receivers. Our bestselling tire valve stem caps fit any standard air valve stem and can be custom made to feature your company logo or graphic. The body of each cap is made from exterior grade ABS plastic finished in your choice of Chrome, Satin or Black. Your custom logo graphics are screen printed with up to 2 colors and a clear, protective dome is applied. As a result, these caps will not yellow, chip, fade, rust or corrode. Our signature tire valve stem caps never interfere with Tire Pressure Monitoring Systems or wheel balance. Each cap body contains an O-ring seal which ensures a clean valve orifice, as well as a knurled head profile which allows for easy installation and removal without the need of a wrench. Minimum order requirement is 300 sets of four caps. A new line of lightweight Aluminum Valve Stem Caps, enhanced with an innovative ABS thread shield for a jewelry-like finish without the concerns of galvanization or TPMS interference, a common issue found with the design of most other metal valve stem caps. Molded EPDM rubber valve seal cannot be dislodged, and keeps the valve orifice clean from dirt, dust and grime. Knurled head design ensures easy installation by hand without the need of a special tool or worries about overtightening. Detailed, full color graphics and high quality base material are sealed beneath a crystal clear, UV protective polyurethane dome. Available in choice of two anodized aluminum body finishes: semi-gloss black and satin silver. Impress your customers, members, staff or guests with a one-of-a-kind automotive picture frame you'll be proud to put your business name on. Each picture frame is built from one of our premium Slimline license plate frames and finished with a quality mat photo board. 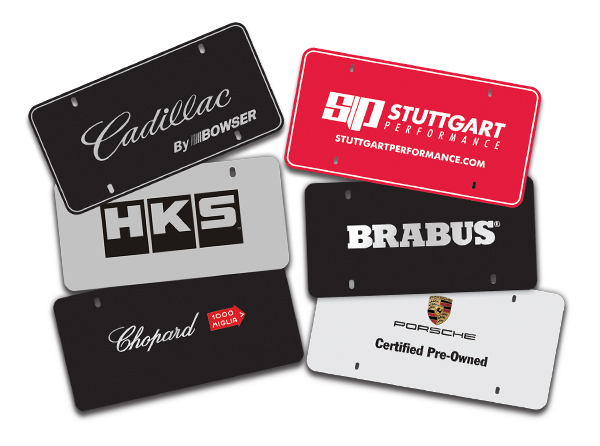 You business logo or message can be screen printed (single color only) onto the mat board, or laser etched on to the license plate frame. Choose from three frame finishes - Polished Mirror Bright, Maintenance-Free Brushed, or Black Powder Coated - and five mat board colors - Red, Grey, Green, Blue or Black. Each picture frame is finished with matching finish hardware hider caps and a non-breakable polycarbonate lens. Picture frame will fit 4" x 6" photos, and can be hung by the durable metal wall hanger or displayed on a table or shelf using using the hinged easel support. Perfect retail or promotional item. Durable aluminum creates a canvas for your precision laser etched graphic that will never scratch, fade or chip. Heat and water resistant neoprene backing protects household surfaces from damage. At 3.5" square and 2.5mm thick, coasters are compatible with most glassware. Exterior grade aluminum easily wipes clean with a damp cloth. *Disclaimer: All customer trademarks presented herein are manufactured under private label exclusive agreement with their owner and are the sole property of these companies (or trademark holders). Their use or duplication outside of these limited arrangements is prohibited without prior approval in writing.